Here it is the first day of Spring with snow still remaining from the last snow storm. 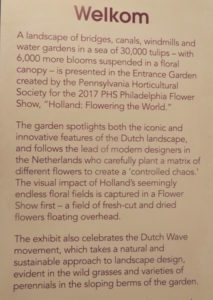 But last week we went to the Philadelphia Flower Show and had a preview of spring with the theme Holland: Flowering the World and saw thousands of tulips as well as other beautiful flowers. Here are some photos taken by my husband, his daughter and me. 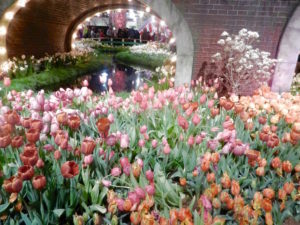 The flowers were beautiful harbingers of Spring! 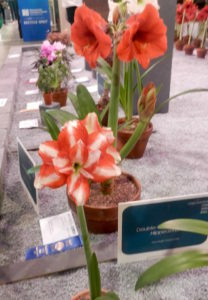 Prize winning flowers that looked like double trumpets. 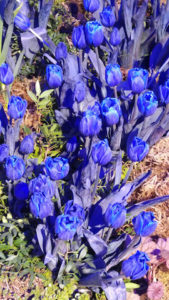 Blue-dyed tulips that looked undyed. 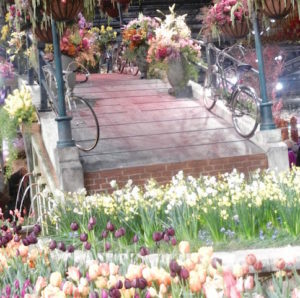 One of the many very large displays that incorporated tulips and bicycles or parts of bicycles. 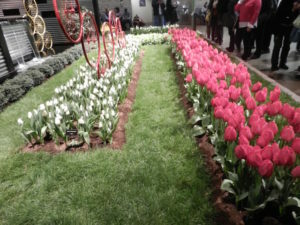 Tulips & bicycles are two recognized items in Holland. 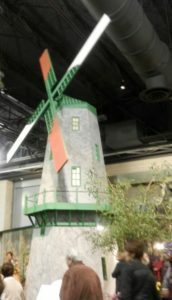 Each year several schools in the Philadelphia area create exhibits or paintings. 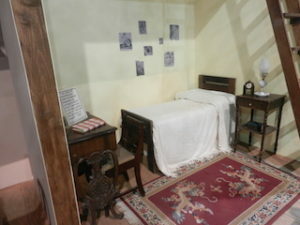 Lincoln High School did a wonderful exhibit combining quotes by Anne Frank, who lived in Holland, a reproduction of the secret rooms she and her family hid in during WWII, and beautiful flowers in front of the rooms. Several of Anne’s quotes were about Nature. 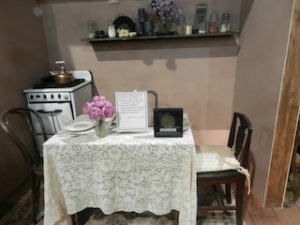 Sensitively and beautifully done. Below this quote were comments by people who connected to the sensitive display. 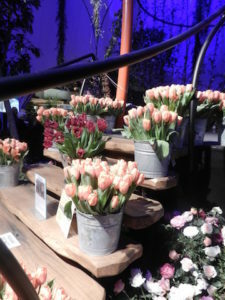 And here is one last photo of tulips taken by my husband’s daughter. The colors at the show were incredible! It certainly gave us a beautiful preview of Spring! P.S. This posting can be found on my Home Page and also under Photo Gallery, from the list of categories on the left hand side of the Home Page. This entry was posted on Monday, March 20th, 2017 at 12:47 pm	and is filed under Home Page, Photo Gallery. You can follow any responses to this entry through the RSS 2.0 feed. You can skip to the end and leave a response. Pinging is currently not allowed.